I have the sense that this project is going to take a while… I’m not big on deferred gratification, and this is going to be fussy to make. I sawed up some Mahogany scraps yesterday and started planing them square. I’m measuring them with digital calipers, which is making me a little crazy. I’m trying to get them square at exactly 1/2″. They will be .512″ in the middle and .487″ at one end and .478″ at the other. Do I throw it away? So far, no. 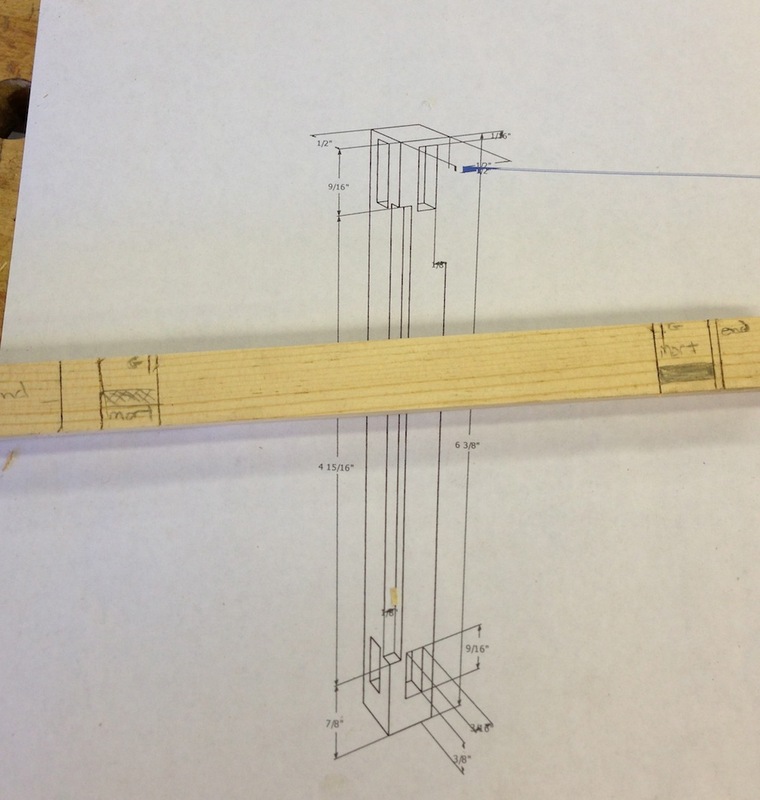 I made up a story stick with the dimensions for the the stiles and laid out four pieces. The layout lines are knifed in, I went over them in pencil to make them show up a little better. I also flattened the back on my 3/16 chisel. I got a Lie-Nielsen set for Christmas and I’m tuning them up as I go. So I started by chopping out the mortises. I only did a couple, just enough so I could get a sense of the scale of the finished part. And get a feel for working in this scale. I cut tenons for the rails and put it together. The rails are set back nicely, but I’m concerned that it’s a little too small. It’s too narrow, compared to the picture. In fact, it’s too narrow compared to my model. I made these rails 3 3/16″ between the tenons because that was what I had in my noted, but 4 3/16″ is what I have in the model. I think the stock dimensions are a little small too. Back to the drawing board. At least I know I can cut little tiny mortises now. Wuffff! This looks hard. Whad you use too cut the mortises? Yeah, but can you do those small pieces on a router table?? Sounds scary. I’m going to the local Lie Nielsen event at the end of the month and I need to pick up some smaller chisels. 3/16″ is pretty small. Joe, fun project. I am working on a pair of table lamps, G & G style, and have come across exactly the same observations you have made. 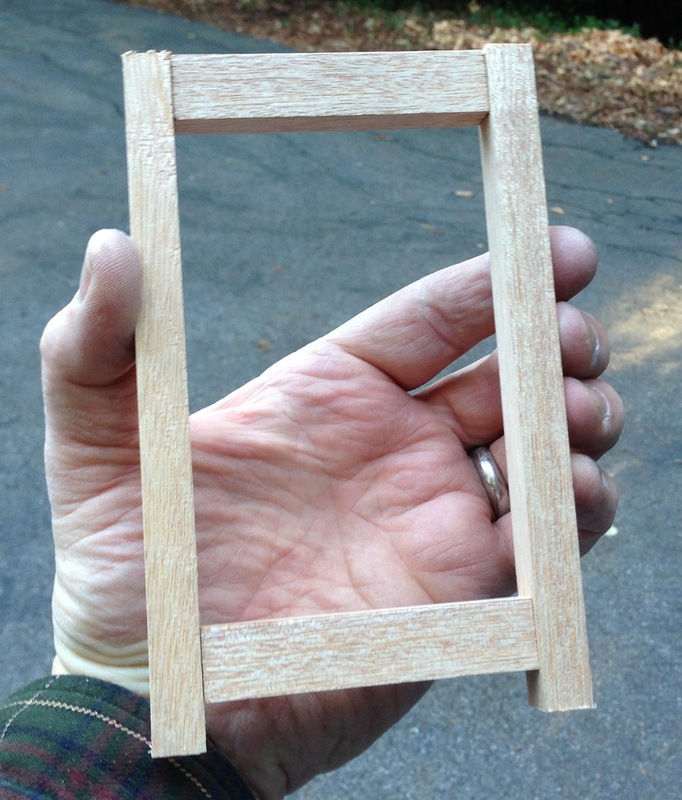 The mortise and tenons are much trickier than they would appear in photographs, and the scale of the parts are deceptive in photos. Photos induce parallax, or something like that. I’ve thrown out the first couple of tries, but now it’s looking sweet. 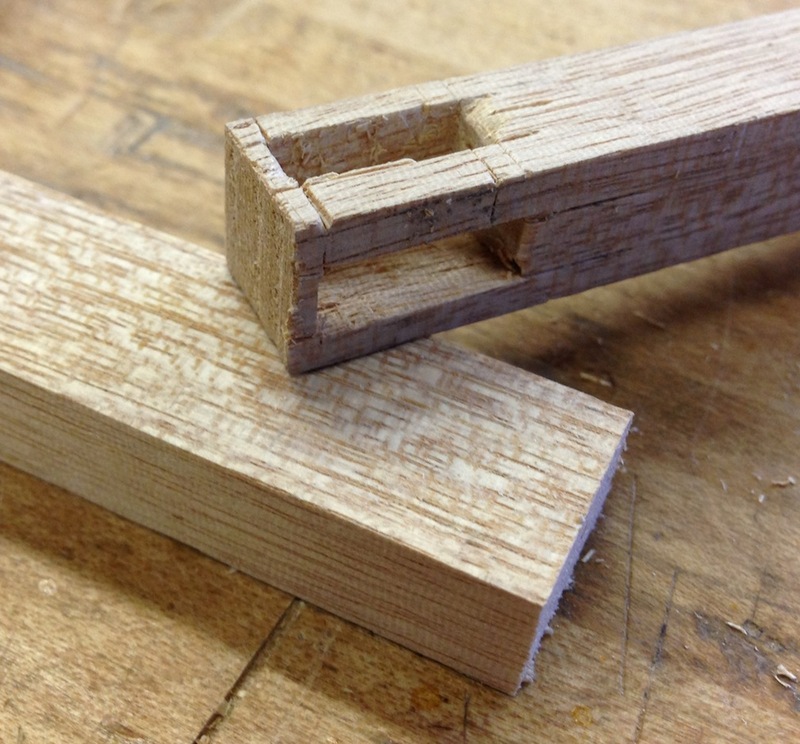 Used 1/4 ” bevel chisels for my mortises. Anyhow, love the sconce you are making ! I’d love to see the lamps you’re making! I’m going to slightly scale up the parts for this, to either 9/16″ or 5/8″ for the stiles. 1/2″ is really tiny. I think I should make a mockup in cardboard next to make sure I’ve got the scale set to my liking. I’ll have to see if I can print full-size from Sketchup. It is the third lamp down, the “Westmoreland Table Lamp”. So far, mine are looking just like the picture. Am making them slightly taller though, 14 inches. Just looked better.